Custom Frame Tents - Get Your Professional Canopy Tent Now! 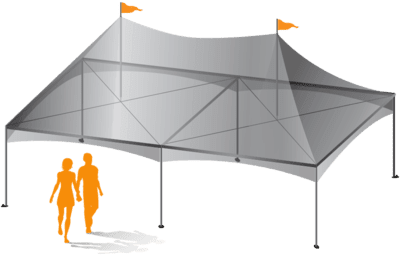 The Marquee is part of our custom frame tent collection that is super strong and easy to setup without the need of any tools. This very popular canopy frame is ideal for many events ranging from sporting to festivals and even private parties. The convenient sized poles make it is very easy to setup requiring only 15 minutes to set up a 20’x20’ and 20 minutes for a 20’x40’. Longer lasting aluminum that will not rust and is perfect for all weather conditions. Select from single or double peak sizes to cover all your event needs. Our simplified poles system technology allows for fast and easy setup. for your next event with a FREE MOCKUP! Allows for simple, faster setup. Provides optimum Safety & stability. The longest pole is only 9ft to allow for fast setup and ease of transport. 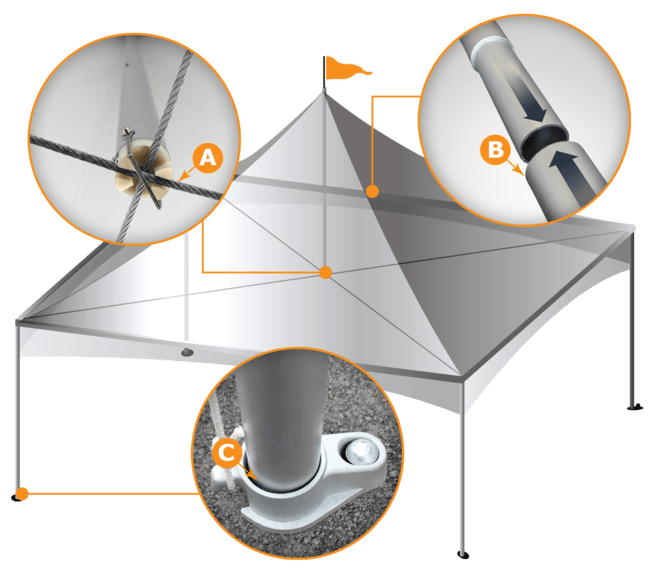 Allows you to securely anchor the frame tent to the ground. Comes with lifetime rust warranty. Comes with complete security kit to properly secure your canopy frame. We use full digital solvent printing on 15oz Vinyl that is UV resistant for longer lasting, vibrant graphics. We can print any graphics that will highlight your brand. Our focus is to make your brand stand out and give it the right presentation it deserves. We can print anything from simple logos to sophisticated designs.